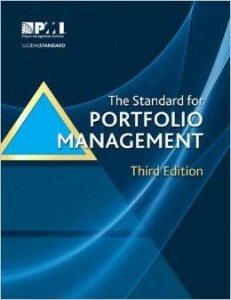 The PMI Standard for Portfolio Management Third Edition is the first edition that is worth buying. Having read the 1st and 2nd editions and reviewed the exposure draft for the 2nd and 3rd, PMI has come a long way with the third edition. Nearly all the major components of portfolio management are referenced in this edition (gate reviews being the most significant omission). At the time of this review, I am preparing for the PfMP exam and have read over most of the 3rd edition twice and have studied several sections in detail. It is still not perfect as there are several inconsistencies and items I consider too theoretical (hence the 4 out of 5 star rating), but overall it is a worthy addition to the portfolio management library. Chapters 1-2 do a great job of giving an overview of portfolio management with the roles and responsibilities needed to make it work. Chapter 3 also does a pretty good job of creating a structure around which to organize the remaining chapters by setting each of the five knowledge areas (Portfolio Strategic Management, Portfolio Governance Management, Portfolio Performance Management, Portfolio Communication Management, and Portfolio Risk Management) in a table with the three process groups (Defining, Aligning, and Authorizing/Controlling). Chapters 4-5 in my opinion are the weakest parts in the book. There are some great additions such as the portfolio strategic plan and the portfolio roadmap, but some of the strategic processes seem out of order (e.g. prioritizing projects before they have been evaluated by a governance board) or are omitted (e.g. gate reviews). In addition, the Portfolio Charter deliverable is just too theoretical for most organizations to adopt. Chapter 6 does a good job of addressing resource capacity management and benefits realization (two big omissions in previous editions). I found chapter 7 to be very useful related to portfolio communication and I got fresh insight on portfolio risk management from chapter 8. In short, the PMI Standard for Portfolio Management Third Edition is worth buying and offers great information for portfolio management practitioners.